Saturday January 2nd 1875 It was late when we got up this morning. Ira and Charlie were down town to a party last night. And Ira gave me a letter this morning. It was some letters Charlie had had from home and forwarded to me. I helped Laura iron in the forenoon. After a late dinner Uncle was going down town and I went with him. I did some little shopping and then called to see Mrs Beecher and left Owen's scarf for him. From there I went over to Works where I staid till nearly train time. The girls went over to the depot with me, Where we found the folks from out home. After the train came and our company from Mason City got started home, we waited for the mail. I got a letter from Lee. I went to bed soon after I came home for I was very tired. Weather intensely cold. 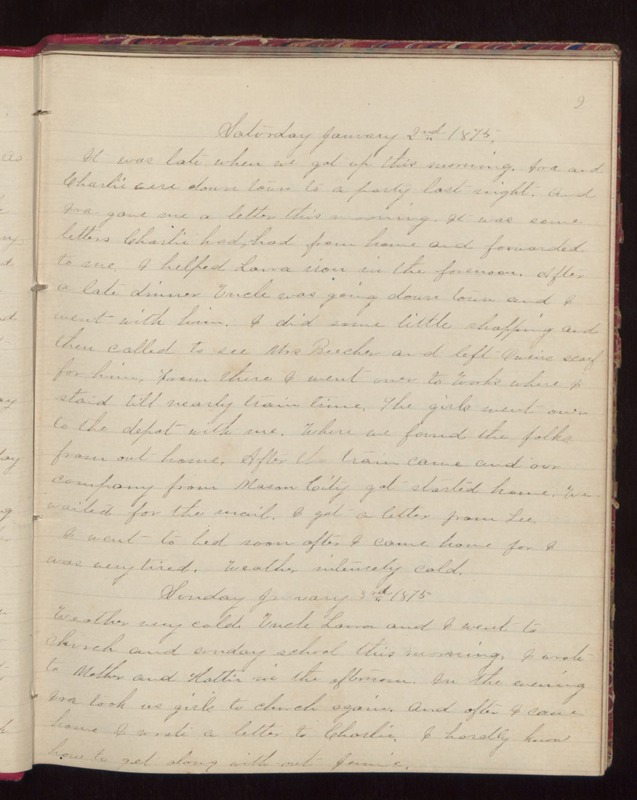 Sunday January 3rd 1875 Weather very cold. Uncle Laura and I went to church and sunday school this morning. I wrote to Mother and Hattie in the afternoon. In the evening Ira took us girls to church again. And after I came home I wrote a letter to Charlie. I hardly know how to get along with-out Jennie.